Having a Star Wars game is kind of a big deal. So when you announce that your game’s campaign is going to be canon, people take notice. It also better be a good single-player experience. During the busy pre-E3 show that was EA PLAY 2017, we managed to score hands-on time for one of the upcoming game’s single-player story missions. Our impressions are ready for your reading pleasure below. First, we were shown the mission we were going to play, as executed by a member of the development team. A short cinematic shows Iden Versio meeting with one of her Imperial superiors, who has a message from the now-deceased Emperor Palpatine via a useful but eerie message android. Easily the first thing we noticed while playing Star Wars Battlefront II is the look of the game. The first game looked incredible, and this sequel keeps in that tradition. The Frostbite engine looked incredible running on a PlayStation 4 Pro, and the level that we were playing had such intricate details, from the wiring and pipes running through the space station we started in, to the sprawling machinery seen on the outside of Star Destroyers. Even explosions looked like they were ripped from one of the more recent Star Wars flicks, which is no easy feat given the special effects spectacles that those movies are known for. One aspect to Star Wars Battlefront II that really left a lasting impression was the sense of scale, especially once we took command of a TIE fighter. 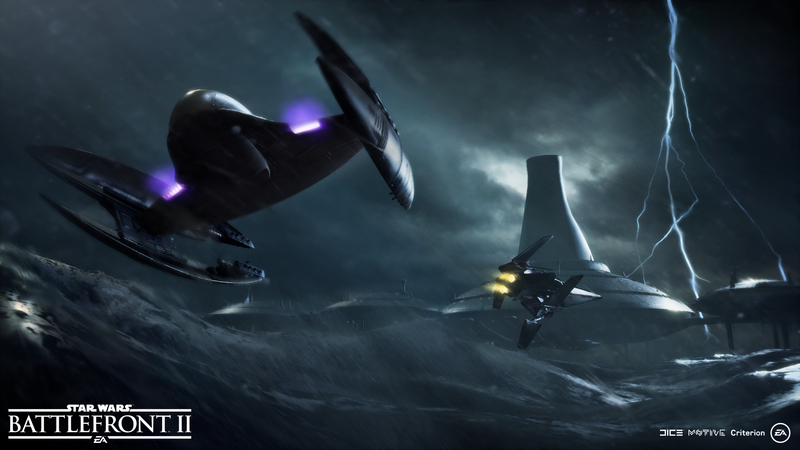 It’s one thing to see a Star Destroyer engaging in combat from afar – it’s another thing entirely to be swooping in and around one while piloting something much, much smaller. A portion of the level we played involved chasing various targets, including one through the decks of a Star Destroyer, and the feeling was impressive, dodging in all directions to stay on-target. Flight controls haven’t changed much since the previous game, a purposeful design choice by DICE. Indeed, flight controls worked pretty well last time around, so why mess with a good thing? The left stick controlled acceleration, and the right stick controlled pitch and roll. The TIE fighter came equipped with various weapons, including a lock-on ion torpedo. Flying in close quarters does have its disadvantages, however – run into basically any other ship, and you should expect to die. After taking out enough targets, we were tasked with landing in a Rebel ship’s loading bay. Once we made it in the loading bay, we had two options – land immediately, or hover around in the loading bay, picking off enemy troops and ships before landing. We chose the latter, of course, and had a blast taking care of rebel scum (pun intended). After landing, the game switched to a first-person camera, and our assault on the ship really began. While Star Wars Battlefront II can be played in either first or third-person, our demo had glitched and we could not switch from first-person. Just goes to show you that no matter how well you may plan things, occasionally things don’t always work perfectly. No matter, the camera angle is a relatively minor thing in a short demo. In the tight corridors of the Rebel ship, enemies lurked around every corner. Most enemies were defeated in a few shots, as the game was likely on easy or normal difficulty to ensure we could complete the demo within the short time allotted for our session. Here, we could get used to Iden’s arsenal. She’s equipped with a grenade that regenerates its ammo over time, the infamous thermal imploder (the grenade that makes a distinctive sound when imploding), and most interestingly, a helper droid. Iden’s helper droid ends up being quite useful throughout the demo. Besides being used as a tactical droid which can kill enemies with electric shocks, it can also be commanded to hack into terminals, unlocking new paths and options for you to explore. In the case of this demo, we were able to see an area that could be completed either with brute force, or some sort of stealth. While we attempted to sneak behind enemy lines and lay down an ambush, the Rebels quickly spotted us and we had to go with Plan B – just don’t die. After dispatching a few waves of enemies, our task was to disable some mounted cannons which were wreaking havoc on the Inferno Squad back out in space. Once complete, a chaotic cutscene ended our demo, seemingly over just as the action was getting intense. 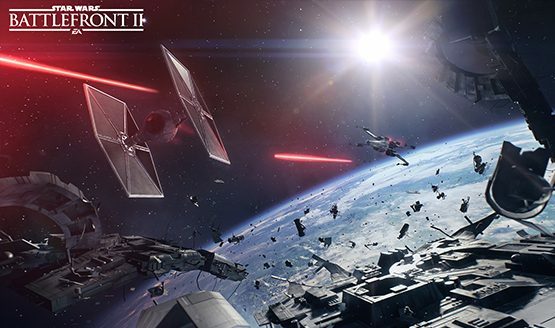 Star Wars Battlefront II is shaping up to be an impressive piece of Star Wars history. In just one short mission, we saw an incredible sense of scale, a seamless transition from space to ground combat, and even some stealth gameplay (which we rushed into a bit due to our time crunch, but oh well). To top things off, the game looks and sounds just as good as, and perhaps even better than, the movies upon which they are based. It’s going to feel like an eternity for many of us as we await Star Wars Battlefront II’s worldwide launch on November 17, 2017.